Yesterday Ethan and Lily hatched a plan to make a few extra dollars because they both want to buy something plastic from the superstore. Meanwhile I was hatching a plan to teach them a lesson in sacrifice and helping others. So today as I baked cupcakes and cookies, they colored posters, and I brought up the idea that maybe their efforts could be used to help someone else in greater need than them. One LOVED the idea, the other...well, it took an extra half hour of convincing. This child wasn't quite sure that giving the money to kids in Haiti who are living in cardboard boxes would indeed make make his heart swell more than a new Nerf gun. By the time me and Lily had pleaded our case, Ethan was on board. 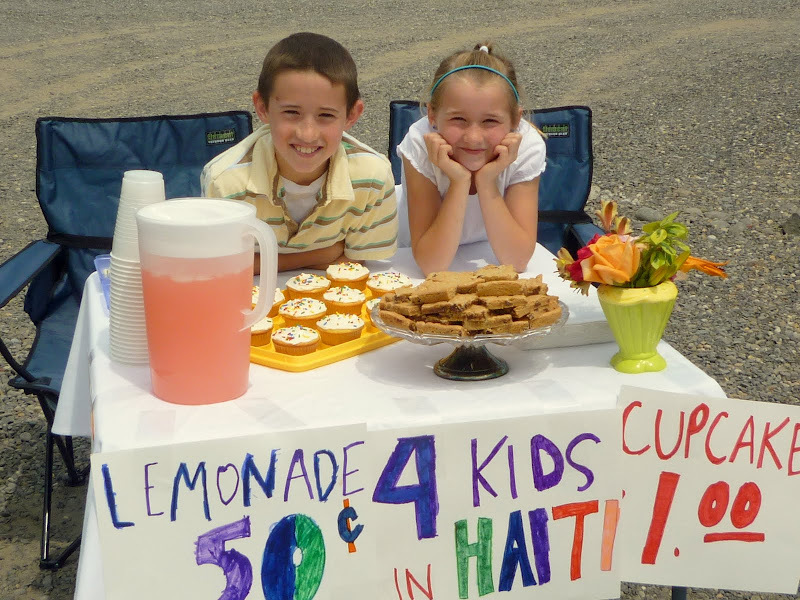 Now, they are out on the corner peddling their homemade cookies and pink lemonade. That giving feels better than getting.